Treat the Mom in your life to a little caffeinated pick-me-up with this deal. 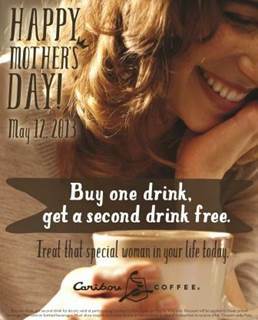 Buy one drink at Caribou Coffee and get one free this Sunday (5/12/13) with this special Mother’s Day Caribou Coffee coupon. Print the coupon or show it to your server on your mobile phone. The coupon is only good on Sunday, May 12, 2013 at participating locations and is not valid on bottled beverages. Your free drink must be equal to or less in value than the one you purchase.